*It was a ghastly, hideous end to the highly-anticipated UFC middleweight match between Chris Weidman and Anderson Silva Saturday night that we’re sure nobody saw coming. It you missed, check it out. But be warned it’s pretty bad. Silva fell to the mat in pain at about 1:16 into the second round. That was the cue for the referee to waive an end to the fight. Replays showed Silva’s shinbone snapped from the force of the contact. The result was a second-round TKO (injury) victory for Weidman, and severe pain for Silva. The 38-year-old Silva was rushed to a local hospital for emergency surgery. A statement from the UFC released on Sunday said an orthopedic surgeon went to work on Silva Saturday night and successfully stabilized his leg. “Following Sunday’s UFC 168 main event, former champion Anderson Silva was taken to a local Las Vegas hospital where he underwent surgery to repair a broken left leg,” the statement sai. 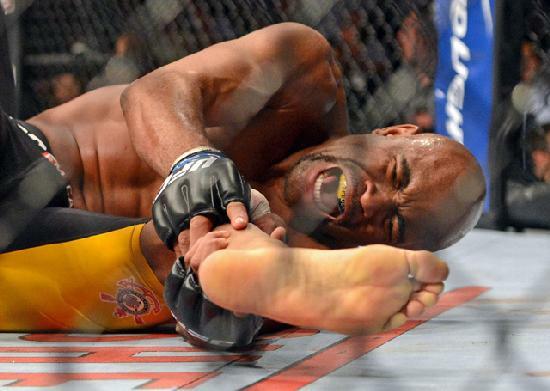 “The successful surgery, performed by Dr. Steven Sanders, the UFC’s orthopedic surgeon, inserted an intramedullary rod into Anderson’s left tibia. On the average, recovery from such injuries can take between three and six months, but there is no guarantee Silva – who’s from Brazil – will ever step into the cage again. Also, on the card, billed as the “co-main event,” Ronda Rousey (8-0) almost met her match, so to speak, in her bout with Miesha Tate to defend her women’s Ultimate Fighting Championship bantamweight belt with a third-round submission win delivered by her now well known “armbar” move. The bout ended 58 seconds into the third round, when Rousey spun Tate (13-5) and pulled on her left arm until the challenger tapped out on Rousey’s thigh.